Lights, camera, stompage. The Royal Academy of Art The Hague's Fashion & Textile 2018 show and expo have been presented and KNOTORYUS got acquainted with the next gen of seers and believers. On the day, the energy and frenzy level was at peak volume so let's ease back and take a close look now the dust has settled. Combining two high-skill disciplines like fashion and textile under one roof with the guidance of a bona fide legend like department head Jurgi Persoons and his faculty of force - including Marina Yee, Peter De Potter, Jan-Jan Van Essche and Hilde Frunt - always yields high-octane results. With Jurgi Persoons now being in his fifth year as headmaster, it's clear the department is picking up the momentum. 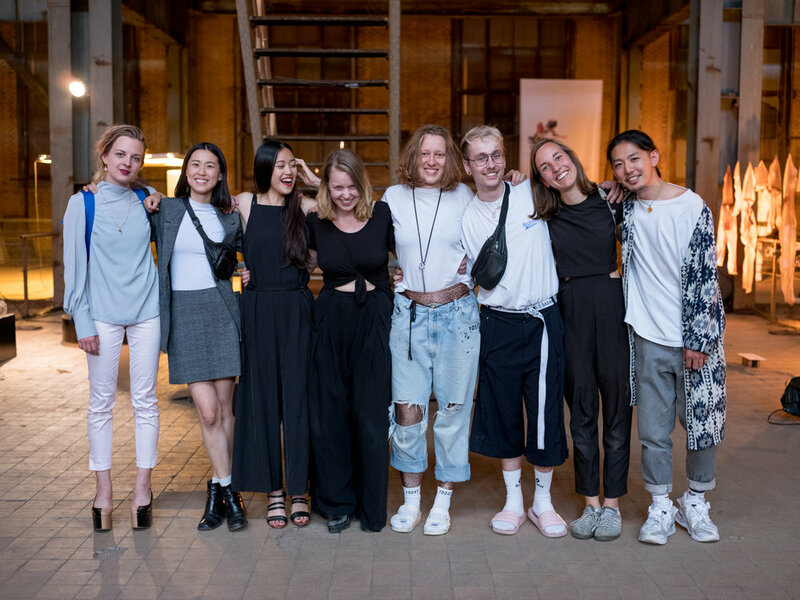 Focusing on this year's fashion graduates, designers Yasmin Boomsma, Timothy Scholte, Yuki Ito and Laura Snijders were the ones to present their final concepts. Yasmin Boomsma felt inspired by 'The Rite of Spring', a famed ballet piece from 1913, but created her own feminist version of The Rite which stresses consent and is set in a post-patriarchal society. Yuki Ito aimed to falsify stereotypes and prejudice, by creating counterfeits of well-known garments like firemen's jackets or army uniforms, twisting their signature traits. The goal being to create a chimera of sorts. Laura Snijders based her graduate collection on her observations of people on the street while interning in Berlin. She imagined a system in which people change something about their outfit every time they enter a new social setting as they traverse the city. A particular standout was Timothy Scholte, whose deconstructed menswear classics-on-crinoline proved a potent show finale. ‘Become a Mary-Ann’ is a collection inspired by two young cross-dressing men who set Victorian society ablaze with their style. The collection aims to be a reimagined wardrobe for men in which staples become volatile objects of desire. When it came to their younger peers, we spotted some great knitwear by Year 3 Bachelor Trumaine Huijts, compelling prints by Tony Ta, glittering menswear by Vincent Wong and much more. The textile department shone brightest during the #EXPOSED expo, where all graduates present their installations in tandem. The first ever Keep An Eye Foundation Award of 10.000 euros was awarded to Joana Schneider, who created an immersive piece made from materials sourced from the netmaking industry. It carries traces of the net's life in the sea, exuding a sense of beauty and fragility whilst simultaneously repulsing the viewer with an eerie grotesqueness. Yani Chuang chose to create a deconstruction of everyday objects to highlight the potential they all hide within. This resulted in fabrics and silicone oozing out of long chairs and club seats, creating new shapes and figures. Yuchen Jao gave us the intriguing 'Mice on Mars', depicting her idea of life on the red planet by toying with construction materials like tubes, yarn, tape and isolation material. You never know when you'll need to get a runway moment going. We've got you with the KABK SHOW 2018 soundtrack. Under the guidance of creative director & art director Peter De Potter, visual artist and master in his own right, "4 Magazine" gives us a close-up glimpse of each student design and its inspirations. If you'd like your own edition, you can get in touch with the Keep An Eye Foundation. Also, if feel like you belong in Peter De Potter's next (book & magazine) project yourself, you can enter his insta-casting right now by using the hashtag #peterdepotter2018. If you'd like to take a look at some of the graduate designs up-close, you can visit the KABK Graduation Festival from July 6 - July 12.